It’s safe to say that everyone wants to be able to focus effortlessly. Just imagine how much you could get done if your brain wasn’t wandering from one idea to the next. This is exactly what OptiMind claims to offer – the elimination of brain fog! You should wake up effortlessly, and notice an intense increase in your focus. The company even offers 10 capsules of their product for free so that you can give it a try. But, I’m here to assess – critically – how OptiMind really works. OptiMind comes in capsule form, and it’s recommended that you take it every day for the cumulative effects to build. This potent nootropic is filled with ingredients that are good for your brain and work in harmony to maximize their benefits. GABA puts your brain in a relaxed state and eliminates stress. This is an amino acid neurotransmitter that also counterbalances blood sugar irregularities. SERINAID® PHOSPHATIDYLSERINE is an actual phospholipid that forms the membrane of your brain cells. This helps your brain cells communicate better, and is essential for your cognitive health. Vitamin D3 allows for the absorption of minerals in your body and is an important part of focus and cognition. Alpha Lipoic Acid provides you with a boost of energy. 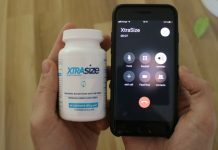 In as little as three days, alpha lipoic acid gives you a small boost in energy levels and has been shown to potentially protect your brain cells from damage. Caffeine (just like you would find in a cup of coffee) is included. This acts as a stimulant to the brain that allows you to focus and boosts energy at the same time. Huperzine A is one of the most popular nootropics on the market. This is extracted from Chinese moss and protects brain cells from toxicity and oxidative stress. Tyrosine is naturally occurring in the body and is used to build proteins and neurotransmitters. This is what will allow you to stay motivated longer and stay more alert. Taurine is another amino acid that protects your cells from oxidation and battles anxiety and depression. Vitamin B12 is essential for your central nervous system. This vitamin combats fatigue and improves memory function as well as energy. Sulbutiamine is an enhanced B-1 vitamin that has been shown to improve memory and enhance your mood. This ingredient also boosts cognitive performance. Vinpocetine is actually extracted from the periwinkle. This product improves blood flow to the brain and allows for easy concentration and increases memory function. Bacopa Monnieri is a herb that grows in wetlands and has been used for thousands of years in Eastern medicine to increase memory function and learning. You’ll start to experience the beneficial effects of this product within the first 30 minutes of using it. 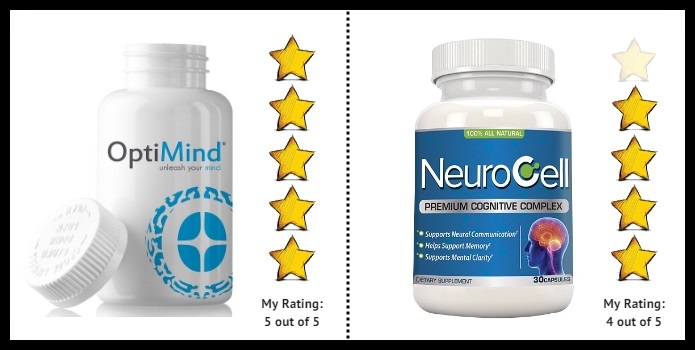 In just a week, you’ll notice that your memory is sharper, and if you continue to use this product for at least six months, you will experience the utmost benefits possible! Pay attention: You’ll be working your way up from 1 pill to 2 pills a day for maximum results, and you’ll be taking this product before a meal. As you probably already know, it takes quite a long time for all of the minerals and vitamins to accumulate in your body and present their full effects. The manufacturer states that there no adverse side effects, and cautions against any ingredients that you may be allergic to. Otherwise, this product will not present any long-term side effects. Pay attention: Did you experience any negative side-effects not listed here? Len all of us know in the comments section! Filled with vitamins and minerals that are missing from most people’s diets! 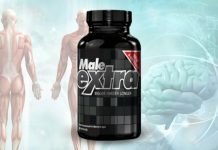 Works to increase memory through science! Really fast effect that cumulates during long-term use! Combines several of the best-known nootropics for brain enhancement! Secure online ordering that comes with 100% money-back guarantee! You can order a free trial pack of 10 pills! Automatically added to an auto-ship scheme! You should be at least 18 years old to take OptiMind! You can not combine it with other prescription drugs or medications! A small chance of experiencing mild side-effects! If you do use this product and find that it doesn’t work for you, make sure that you call the company and cancel your auto shipment. Pay attention: The company enrolls you in an auto-shipment program even if you only give this product a trial! 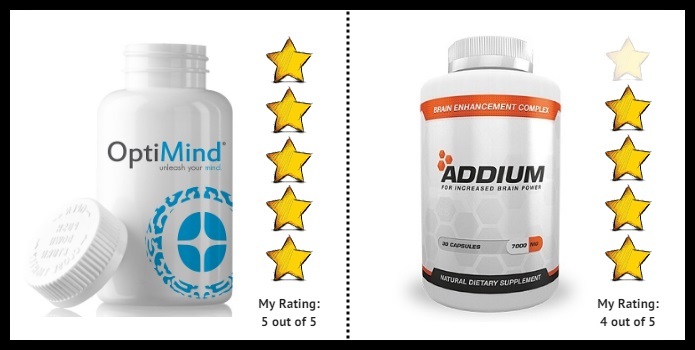 The Addium belongs among one of more popular brands of nootropics people often ask about on various forums. Here is how it stands against OptiMind! – The first results of both products will become visible in just 30 minutes with the biggest effects observed after 2 hours (they wear off after 6 hours in general)! – OptiMind can cause (except allergic reactions) headaches, dry mouth, upset stomach, or even nausea. – Addium can cause skin redness, and jitters. 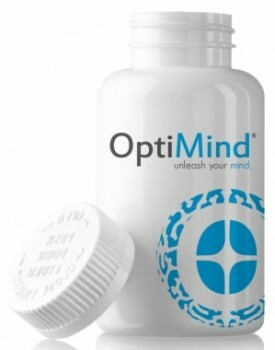 – With OptiMind, you are recommended to take 1-2 capsules a day. 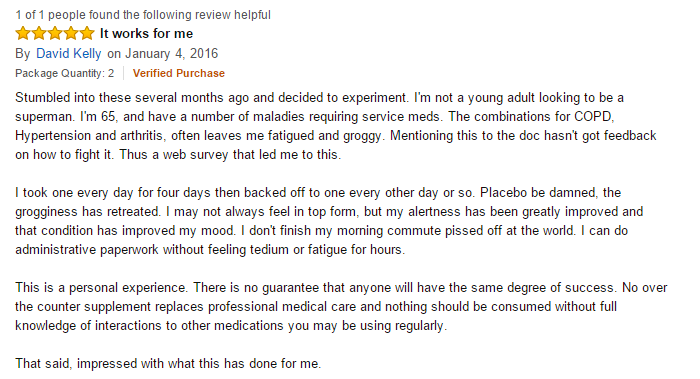 – In the case of Addium, you only need to take 1 pill in the morning. – For a 1-month supply of OptiMind, you will pay $43.31! – For a 1-month supply of Addium, you will pay just $39.95! I have to say that Addium is a slightly better choice as it causes fewer side-effects, has more comfortable dosage, and is less expensive! Another well-known brand of nootropics out there is called NeuroCell. Here is how it stands against OptiMind! – Both products can cause (except allergic reactions) headaches, dry mouth, upset stomach, or even nausea. – With OptiMind, you are recommended to take 1-2 pills once a day. – With NeuroCell, you are advised to take just 1 capsule in the morning. 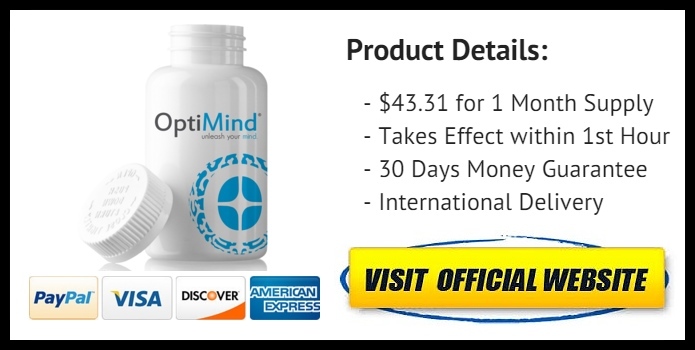 – For a 1-month supply of OptiMind, you will pay just $43.31! – For a 1-month supply of Neurocell, you will pay $57.95! These products are almost the same. While NeuroCell has more convenient dosage, the OptiMind wins for its lower price! The last brand I am going to compare is called Geniux (Extra Strength). Here is how it stands against OptiMind! – With Geniux, you are advised to take 1 pill once a day. – For a 1-month supply of Geniux, you will pay just $39.00! 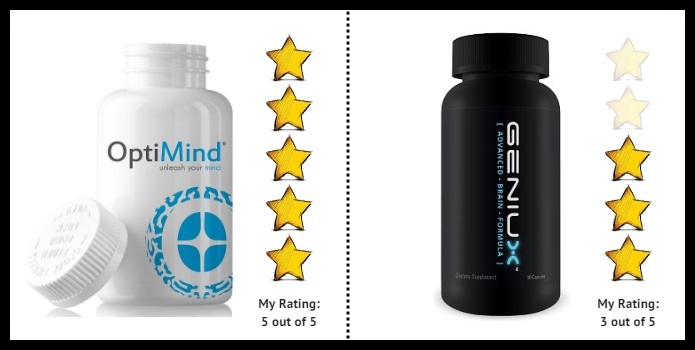 Although Geniux is a slightly cheaper option, I have read a lot of complaints against this supplement. Therefore, you should rather go for NeuroCell! Pay attention: Because there is a growing amount of false user reviews on Amazon, I have decided to provide you with the most helpful feedback only from users with verified purchase! 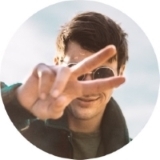 I have to admit that marketplace for Nootropic supplements becomes highly competitive, and the OptiMind definitely belongs to the group of products that include potent and effective formula. The producing company uses a great design for packaging, offers an honest list of used ingredients, and provides an extremely competitive pricing policy. However, you will be automatically added to a monthly automatic shipment program (you can easily cancel this by calling the manufacturer)! 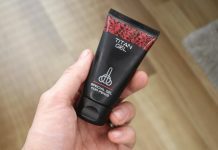 Aside from this, the product seems to work great. But I hope that the company is a little more transparent in the future with their monthly automatic shipments!